What do you want from a Mortal Kombat game? Chances are you’ll start with something about violence—guts, shattered bones, gonads destroyed like stepped-on grapes. Lower on your list you might mention balanced fighting. A story—something about elder gods and damnation—is probably a final afterthought, like cistern blocks on a shopping list. Mortal Kombat X delivers all these. It has horrendous, hilarious fatalities which draw gasps then revolted laughter; the most enjoyable, immediate fighting of any Mortal Kombat game; and, quite surprisingly, an actual story. Admittedly, it’s more gore than Gore Vidal: QTEs of cartoon fistfights and X-rays of exploding testicles illustrate a world where blind swordsmen and fallen Hollywood idols lead military incursions. However, unlike any previous game in the series, it adds marrow to Mortal Kombat’s narrative skeleton. Taking place over 25 years, it fleshes out the histories of notable characters by introducing us to their children (all of whom inherit the fisticuffs gene). It’s batshit, obviously, but so lovingly executed that I was swept along regardless. The story would be irrelevant if the fighting was rubbish. Mortal Kombat has always felt brutish compared to the elegant flow of Street Fighter 4. It's about heavy-fisted, filthy pub-fu, with a focus not just on defeating your opponent, but destroying them utterly. This is the most elegant incarnation yet. The returning super meter—borrowed from Street Fighter—adds complexity, allowing you to interrupt an opponent’s combo by using up two bars of the meter and create openings for a counterattack. X-ray moves function like traumatic ultra combos, diverting a fight with damaging and humiliating specials. I quickly found myself experimenting with Ex variations of familiar moves, tagging them onto the end of combos for increased damage. 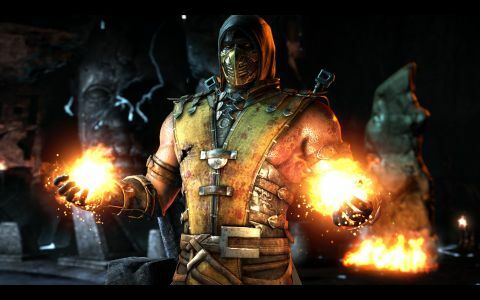 Fighting is the only thing this game takes seriously: startup frames are even shown in the menus, making Mortal Kombat X accessible, but still rich with tactical options. It’s batshit, obviously, but so lovingly executed that I was swept along regardless. Each fighter has three variations, similar to Mortal Kombat: Deadly Alliance but without the option to switch during play. Let’s use Scorpion as an example, because fire ninjas. Inferno tricks him out with demonic minions, useful for zoning and gnawing ankles; Hellfire is an offensive build utilising fireballs and flame attacks; and Ninjutsu is his classic move set with added swords. Core specials are the same throughout—it would be monstrous to rob you of that iconic spear—but the stances add a strategic thrust to every encounter: think roshambo, except the loser gets their ribcage made into a glockenspiel. Be prepared for minor changes to your favourite characters, though. After five minutes spent trying to summon hellfire, worried I was messing up the combo, I discovered it wasn’t in the build I’d chosen. This might frustrate some, but it made me experiment with every variation. It looks as lovely as a game featuring sliced tongues and smashed brains can. The x-ray moves are a highlight, full of detailed splintering spines and skulls which crack like own-brand Easter eggs. Backgrounds are great, too. Like Injustice, they incorporate contextual attacks, but Mortal Kombat is better because it lets me throw old ladies at my enemies. However, there are notable PC-specific problems. Screen tear is apparent even on high-end machines even with vsync seemingly activated. In fact, unlike Mortal Kombat 9 (or whatever it wasn’t called), there’s no option to disable vsync in the menus—you’ll have dig into appdata or tinker with your graphics card. While it runs at a buttery 60fps during fights, cutscenes and x-ray moves drop to 30fps. More worryingly, I had trouble making it playable on a machine which met minimum specs; only when I switched to a meatier PC could I enjoy the game to its fullest. They’re notable problems with an otherwise excellent game, and it makes the PC version feel under-optimised. Online, it's even shakier. At least a third of my ranked matches choked and died, usually at the point things became interesting. Much like the offline game, it's more frustrating because the ideas are so promising. There are stacks of competitive options, from standard player matches to winner-stays-on king of the hill. Matches also inform an ongoing faction war: you pledge your allegiance to a familiar Mortal Kombat organisation, such as the Lin Kuei or Black Dragon, and your wins count towards a weekly faction ranking. However, it's difficult to remain engaged in a pretend ninja feud when every third match creaks like a shopping trolley dragged from a bog. Each frame in a fighting game matters, and Mortal Kombat's online simply isn't sturdy enough to remain competitive. Tech issues aside, MKX is crammed with extra stuff. Challenge towers function like arcade mode, setting you against a number of increasingly difficult opponents. There are some pleasingly daft variations: Test Your Luck throws in a new modifier every round, anything from tilting stages to exploding enemies. Even the Krypt, which houses all the unlockable goodies, is treated with lively reverence. Rather than presenting you with numbing menus, it’s Legend of Grimrock with grave robbing: a first person adventure through classic Mortal Kombat locations. It takes time to unlock it all, but I’m fine with that: it’s part of the series’ heritage, going back to Deadly Alliance. DLC and pre-order characters are trickier. They’re present in every fighting game, but it’s miserable to see Goro smiling at you from the character select screen, like a smug, premium-priced prick. In terms of content, you’re getting your money’s worth: this is the most complete Mortal Kombat game ever, predictably brilliant at schlock and surprisingly adept at story. Unfortunately, a limping port lessens the experience for anyone without a godlike machine.